June – a Tasty Time! June blooms mean tasty veggies! The first tomatoes have now been eaten at Pilgrim Terrace Community Garden, and one bell pepper! June is not so much a planting month as a maintenance month and getting those first veggies! You can continue to plant more rounds of your summer plants, especially the ones that don’t have continuous production like indeterminate tomatoes that will produce all season long. 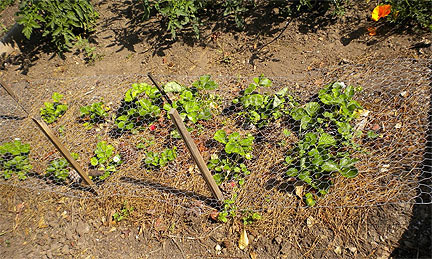 Stoke up your soil, replace plants that didn’t make it, that are done already – mature or bolted chard, cilantro, lettuce, arugula, beets, or are ailing. Special Strawberry Tips! Don’t let them dry out, they will stop producing. Mulching is good. This month they tend to grow more leaves, send out runners. Clip off the runners for now, later we will let them grow. Give your strawberries a little fertilizer in the 0-10-10 proportions; that’s phosphorus and potassium for strong roots and uptake of nutrients, blooms and fruits! They love pine needle mulch, if you have some about, because they prefer slightly acidic soil. Use the cones to drape your berries over to keep them off the ground, away from chewing creatures. 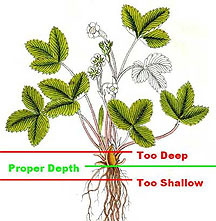 Water deeply, specially as each plant needs. That’s more frequently for short rooted beans, cucs and strawberries, thirsty lettuces. Irregular watering = funky shapes; too dry = bitter, production can stop. Water seeds/seedlings daily. If they dry out once, they’re dead. Immediately after planting and watering your new little plant in, sprinkle on some Sluggo. Sprinkle Sluggo just before your seedlings come up. Tiny tender plants are irresistibly delicious! Side dress/fertilize, especially if leaves are looking pale or your plant is puny or slowing down. Blood meal for a quick fix, otherwise, compost, a little manure raked in, liquid kelp & fish emulsion mix. Epsom salts for your peppers, once when they bloom and again ten days later. Go very gently with beans, tomatoes and strawberries. These are not leaf crops, you want fruit! Too much N (nitrogen), and you get a lot of leaf, little production. If your planting bed was too rich or you over fertilized, bee bop on out to Island Seed & Feed (if you are in the Santa Barbara CA area) and pick up some Seabird Guano (NOT Bat Guano!). The Seabird Guano is high in phosphorus, promotes healthy root growth, greatly increases the number of flowers, increases the available phosphorus in the soil and enhances beneficial bacteria activity in the soil! It is good to use generally just before your plants flower or you see the first flowers! This inexpensive treatment is a wonder! Imagine how many beans, strawberries….Yes! Now plant heat tolerant and slow bolting varieties of cilantro, and lettuces – Nevada, Sierra, Jericho, Slobolt, Black Seeded Simpson. Bolting, a natural maturing phenomena – the center of the plant shoots up and forms flowers, is caused by accumulated light hours, warm temps, and water stress. Another thing to find is varieties that are leaf tip burn resistant. Might plant them under a bit of a canopy or in the shade of a larger plant? As your big plants get up, clear the lowest leaves and tuck some lettuce or dandelion greens underneath? Harvesting is not just for food! Just like deadheading flowers, when you harvest, they keep coming! Eat little zuchs flowers and all! Pull beans and cucs continuously while they are young and tender. No storing on the vine, or you plant will think it is done! Continue to harvest your broc side shoots. Once it goes to flower (they are edible – sprinkle them on your salad! ), no more side shoots. * * Plant special flowers, herbs, or veggies for summer Hostess gifts! Friends getting married in June?! Why not give them plants for their new garden together?! How symbolic! Plant a little extra all the time for ready gifts for any occasion!